If you want to build a website today, it’s gotta be responsive and optimized for mobile devices. But it’s also got to appeal to large monitors and that’s where the need for full-screen WordPress themes comes into play. You see, themes that take up the entire monitor make a powerful impression right away. They’re bold and in-your-face–in a good way. They make it impossible to look away, and they demand attention. Which is a very good thing when you’re trying to get visitors to convert into leads or customers. Beyond the obvious that many devices support full-screen viewing, you’ll also want to consider themes with full-screen layouts, sliders, and parallax effects because they are truly immersive. Without a box around your site, the content stands to resonate stronger with your visitors. These themes are a surefire way to make a memorable statement about your company or brand. They also tend to work really well on smaller mobile devices, and that’s the way the internet is headed–into the palm of your hand. 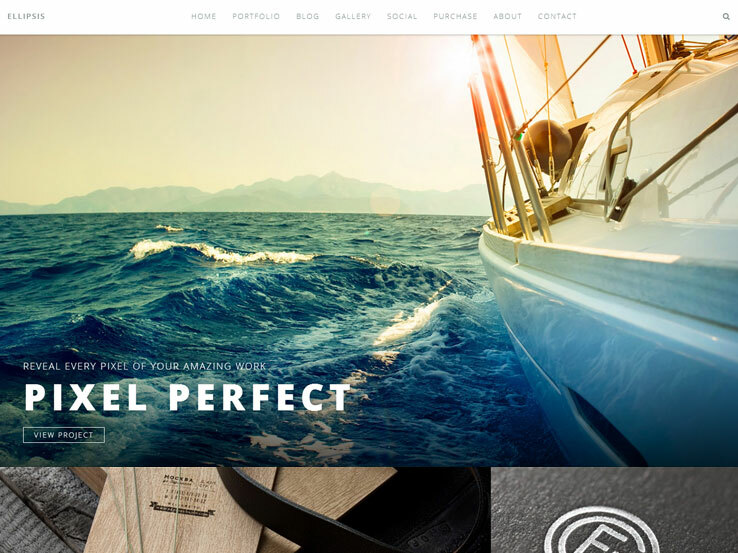 Enjoy this collection of the very best full-width WordPress themes. I’ve tried to curate a collection that offers a range of the many full-screen styles that are in use today. Look for auto-scaling full-width slideshows, video and image backgrounds using CSS cover tricks, and full-width content using flexible, fluid layouts. I’ve attempted to cull any themes that don’t function well at all viewport aspect-ratios and device sizes. Please let me know if you feel I’ve overlooked an issue that would disqualify any theme in the list. 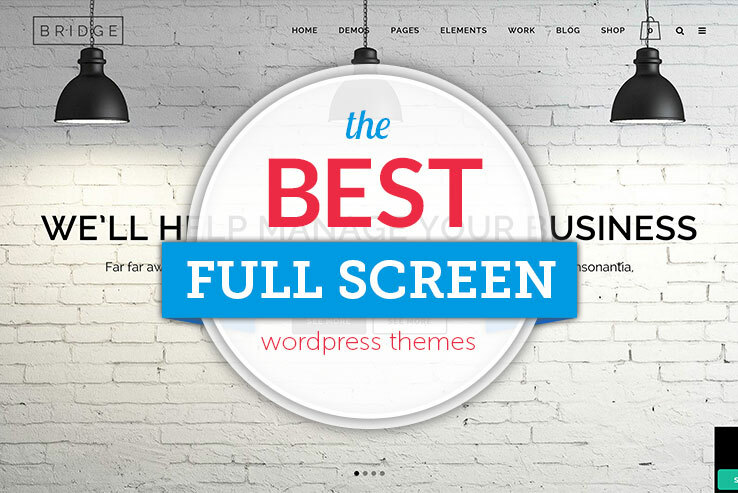 Also leave a comment with your suggestions for the best full-screen WordPress themes. This is a rapidly growing trend in the WordPress theme world, so we’re going to be updating this post often. Check out the Parallax One theme if you’re interested in a killer full-screen solution without the clutter of many other options on the market. This is a stunning and responsive theme that looks fab on mobile devices. Localization files are a huge plus, considering many businesses and bloggers are trying to expand their horizons and reach a global audience. 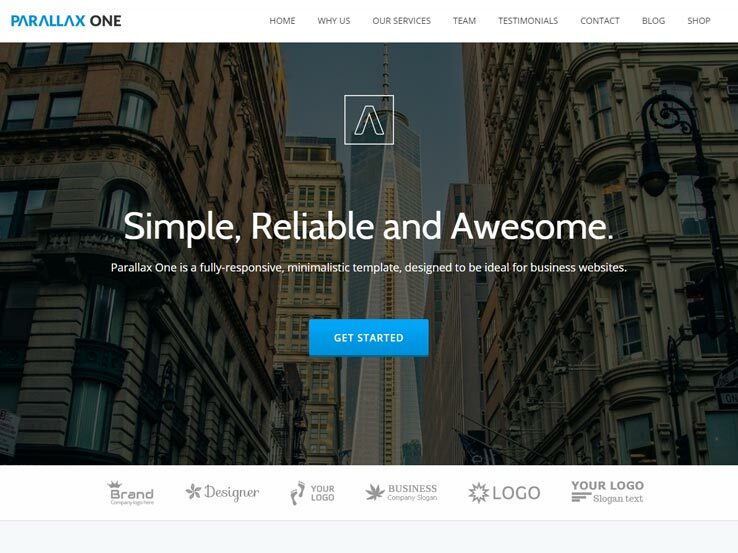 Parallax One provides a stunning header area that takes up almost the entire screen. The parallax effect is perfect for adding visual appeal to your website, and with the overlaid text and buttons, you can easily point the users towards other parts of your website. As is the case with many one-page WordPress themes, Parallax One includes a wide variety of content blocks. These are easy to implement and allow you to add sections like products or client testimonials. Feature your team members along with their names, titles, and add stunning animations when someone hovers over their image. The client testimonials area includes a space for the testimonial as well as a profile photo of your previous clients. Several call-to-action buttons can be scattered throughout the homepage, and the Latest Posts widget allows you to feature several of your recent posts, which is an excellent way to keep visitors engaged with your website. The theme includes map support, and the contact form combines well with items like social media buttons and contact information to connect with your audience on social media as well as allowing them to reach out to you. 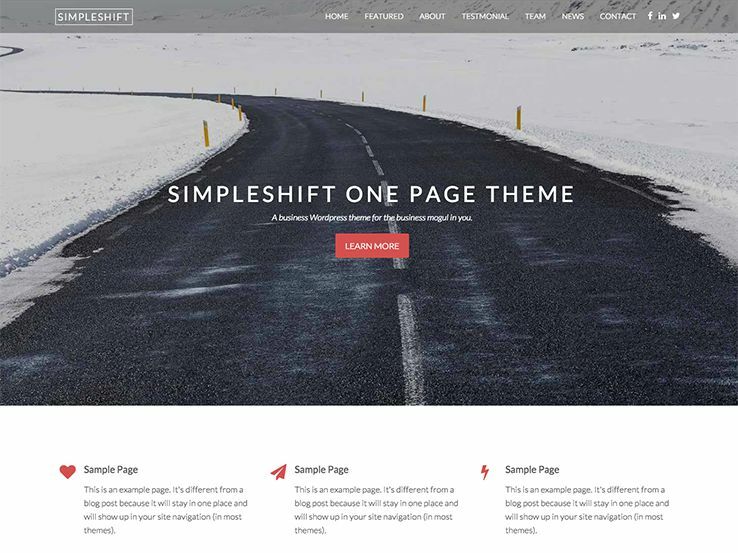 Check out the Simpleshift WordPress theme if you’d like a full-screen layout with tons of options. This theme is made to work as a one-page layout, meaning that most of your content is going to reside on the homepage. This cuts down on the amount of work you need to do to set up your theme. 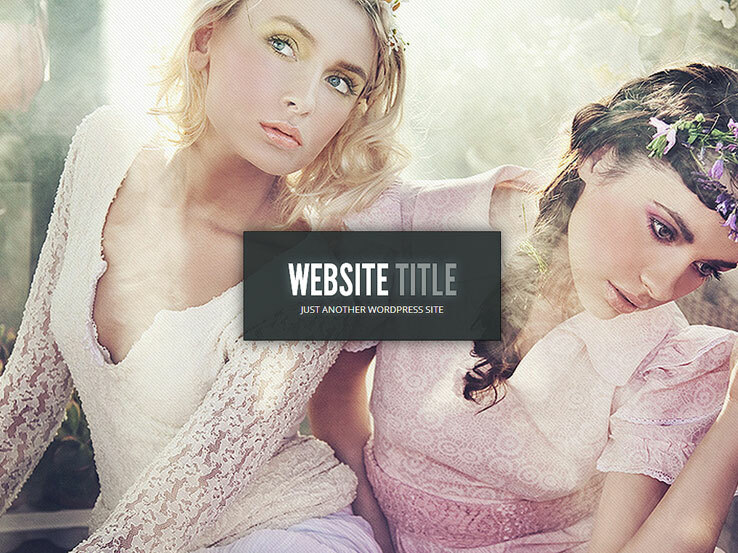 The theme has a stunning header image, which is sure to grab the attention of your visitors. The header supports high-resolution images and provides a spot to place an overlaying button and call-to-action text. This is the perfect area to provide a short blurb about your company and to direct people to your blog posts or sales pages. Additionally, the full-width header includes parallax effects that provide an interesting animation effect without slowing down your website. Many bloggers and photographers use parallax effects to boost their conversions and increase user engagement. The navigational menu sits at the top and has a transparent look that makes navigating your website easy without overwhelming your visitors. The Simpleshift theme eliminates the amount of plugins needed, as it includes and easy way to upload your logo and custom social media buttons so you can grow your following on social networks like Facebook and Twitter. This is a one-page theme, so you get pre-built sections to display your content on the homepage. One of them can be used to feature testimonials from past clients, while another one can be used to feature the members of your team. The team module has social media buttons and description area for biographies. Along with contact forms, icons, and a section for latest blog articles, the Simpleshift WordPress theme is an option that you shouldn’t pass up. Oh, did we mention it’s completely responsive? 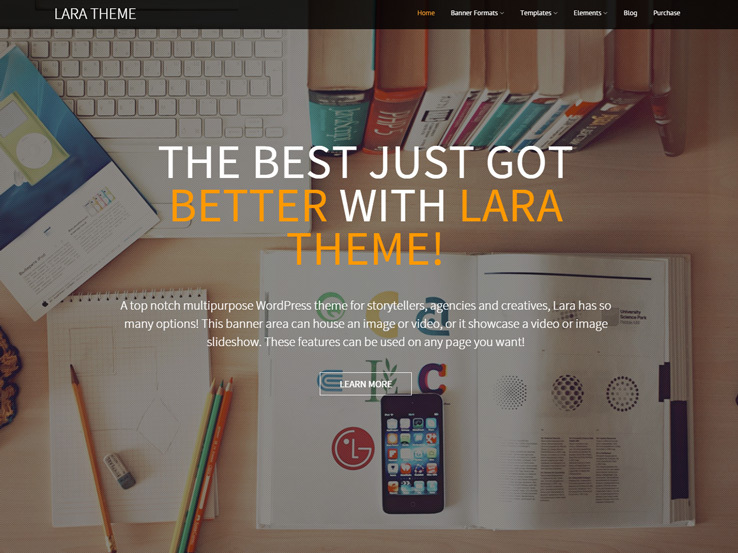 The Lara theme is the ultimate multi-purpose WordPress theme featuring full-screen video and image capability making it one of the most exciting themes of this year. Choose from dozens of banner and page layouts that can be applied not just on the frontpage but on all posts and pages across the enter website. This ability means you can create entirely unique landing pages that have a frontpage feel to highlight special product categories or service departments. The theme is fully responsive so it will look amazing on screens of all sizes and comes with unlimited support from the relentlessly friendly Nimbus support team. If there’s only one theme you check out this year, Lara should be that theme! The Ember WordPress theme offers a nicely organized full-screen layout. 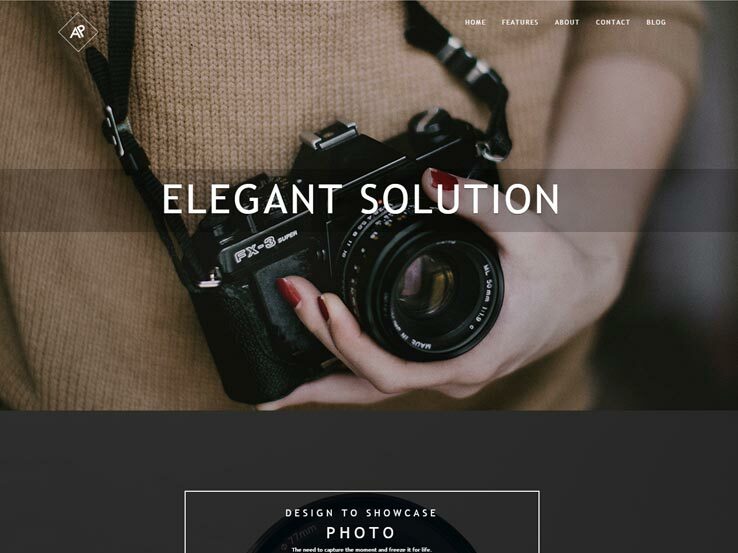 The header section is sure to capture the attention of your visitors, thanks to the stunning parallax effects and the ability to add overlaying text and buttons to the header. This is a great way to direct your website visitors to your most important content, like a sales page or an email signup form. The menu area at the top is an excellent way to facilitate the navigation on your website. This one-page theme is also fully responsive, and the various homepage sections offer plenty of space to include all the important aspects of your website. This eliminates the need to click through multiple pages, which is especially important when you consider more and more are surfing the web on their smartphones. In addition to its full-screen elements, Ember has plenty of other features that complement the design. The theme includes several custom icons to highlight all the services you offer. They are nicely laid out in columns, making it easy for potential clients to quickly find the service they need. You can also include multiple call-to-action buttons throughout the homepage. On top of that, Ember also includes a team member module so you can feature everyone who works for your company. Add images, job titles and links to their personal social media accounts to ensure that your company has a more personal feel and to show the appreciation for your team members. Build trust and show what others think about you by including testimonials from your previous clients. 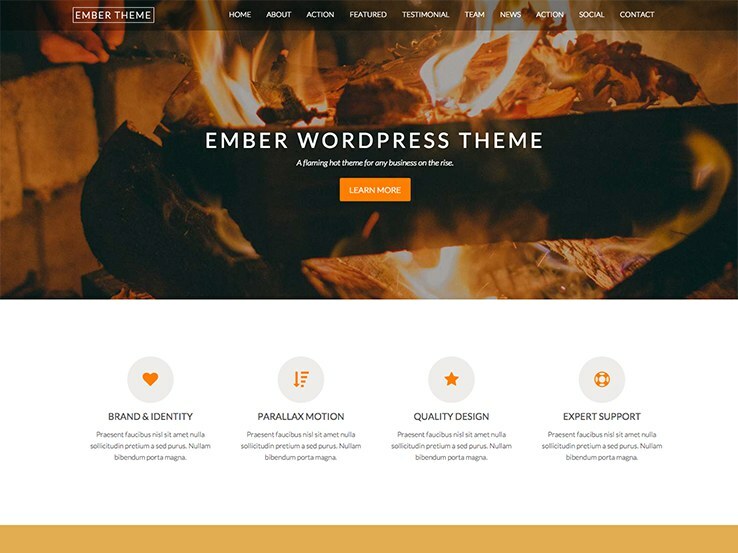 Along with shortcodes, widgets, contact forms, and recent article widget, the Ember WordPress theme is a must-have for those interested in full-screen layouts. 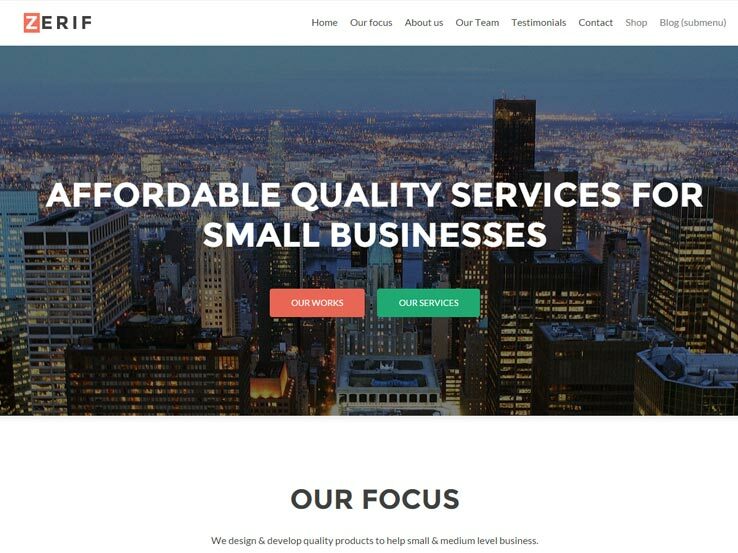 Zerif Pro is an excellent example of a WordPress theme that offers full-width sections in the very popular modular row style. What I really like about the Zerif Pro theme is the attractive use of parallax background image motion in these full-screen rows. 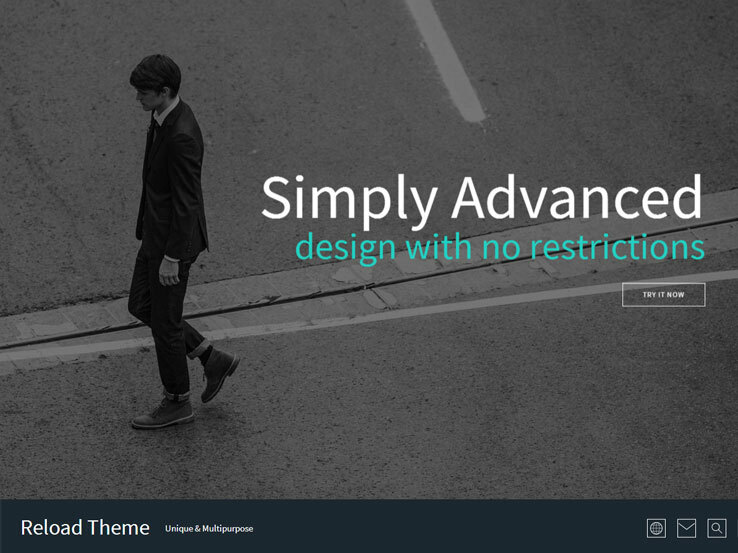 Zerif Pro is one of the most popular themes of 2015. A quick review of the most popular themes on the free theme list at WordPress.org will reflect the popularity of the themes from Themeisle. They are known for creating beautiful themes using excellent coding standards and providing stellar support. 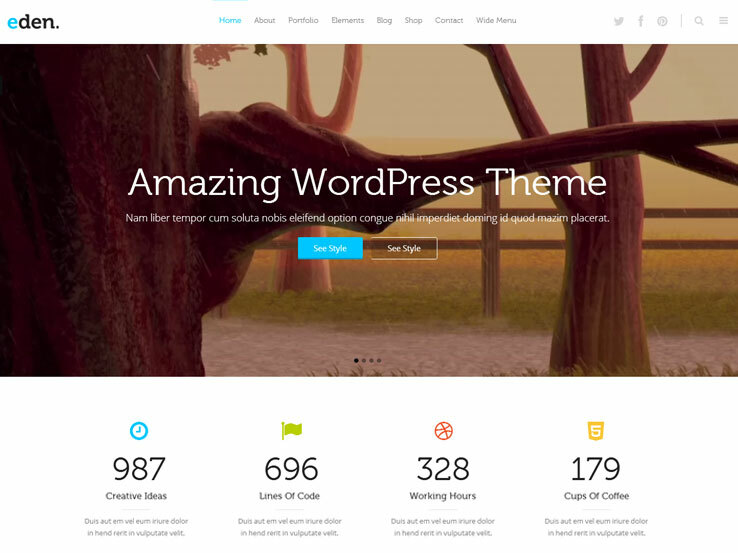 Divi is the first mega-theme from Elegant Themes. It comes packaged with dozens of layouts, many of which are full-screen. The Divi theme has been extremely popular since its launch earlier last year – and rightfully so! 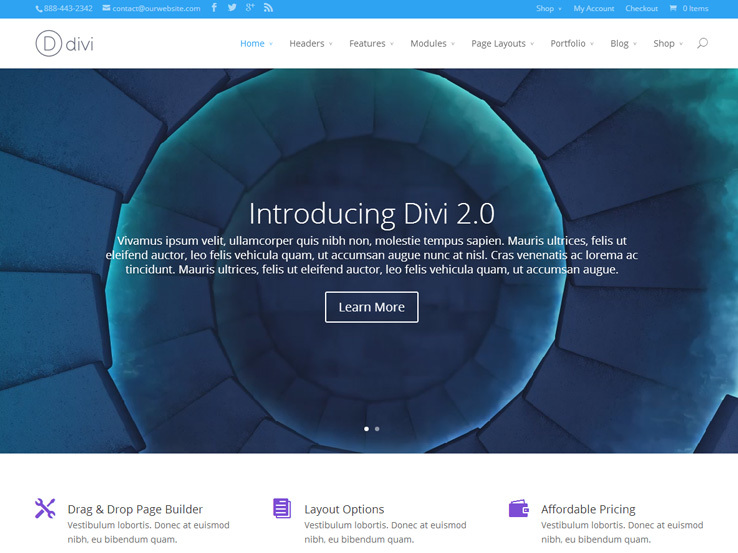 With a visual drag-and-drop editor, layout modules, portfolio, tons of header options and under-the-hood features, Divi is a sure-fire win for the web design world. If you are looking for a great canvas to work off of, Divi is the way to go. RokoPhoto is a fabulously beautiful photography, portfolio, and blog theme. No matter which option you choose, you’ll notice the well-balanced design and clean functionality. The theme is also responsive, which means your website will look amazing on all screen sizes, and the stunning slider at the top is sure to catch the attention of anyone who lands on your website. RokoPhoto’s blog is clean and open and genuinely highlights the photography you include in your posts. The portfolio displays in a full-screen thumbnail grid with a very nice hover effect. Story is a superb full-screen template featuring a mega menu, gallery, blog, and shop – everything you need in a multipurpose WordPress theme! Everything about this theme is beautiful and thoughtfully designed and developed with buckets of style. The blog layout includes a fabulous parallax header with smooth transition effects. On top of that, the theme has plenty of white space to put the focus on your photography. Story theme is one of the top sellers on Themeforest, and for good reason. It’s a clear winner. 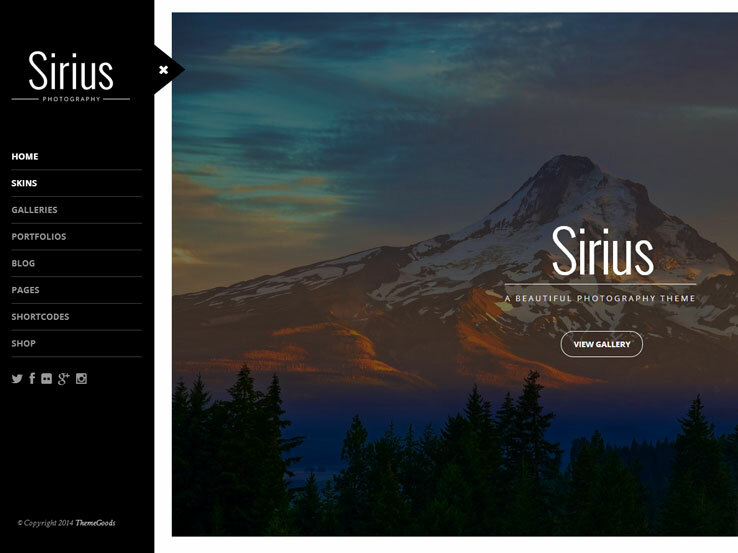 Sirius is a beautiful WordPress theme with a slide-out left menu that leads users to a built-in blog, portfolios, galleries, shop and pages. The theme supports Retina-quality images, mega-menu navigation, and is WooCommerce ready. 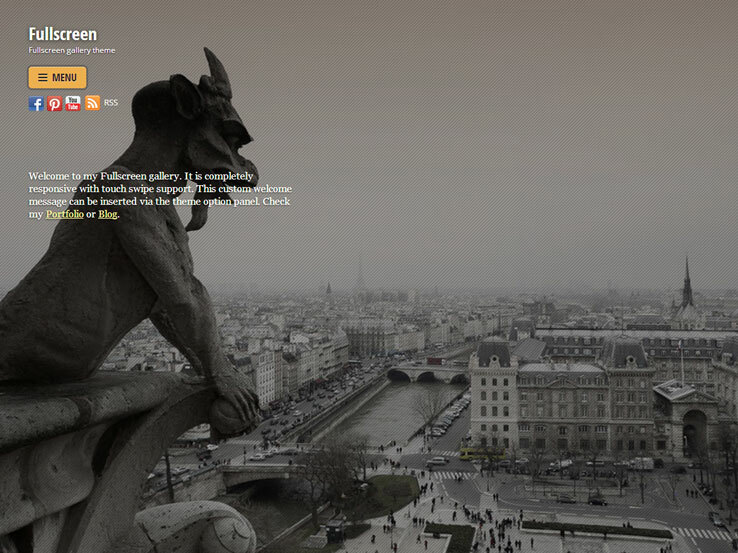 This theme can easily adapt to a wide variety of niches, even though it’s primarily geared towards photographers. The full-screen slideshow on the frontpage is unique and worth taking a look at if the imagery is central to your businesses brand. A standout feature on this theme is the use of bold typography with high-contrast colors. Reload, a responsive, full-screen, multipurpose WordPress theme that is WooCommerce ready and comes with Revolution Slider, Visual Composer, WPML support, and Redux Framework. Reload also includes a ton of theme customization options and is translation ready. The theme sales page advertises twelve predefined color skins/themes that will make it easy to integrate your website with your brand. Reload is the perfect example of the latest trend of a modular row-based design and a huge amount of parallax motion to generate an extremely engaging user experience. Reload has successfully combined those two trends to make a truly impressive WordPress theme. Inspiro is a high-impact photography theme that is WooCommerce-ready and includes a visual builder and gallery. Choose from a variety of preset templates and add as much or as little content as you’d like to the row-based home page. Inspiro has a dynamite layout if you’re looking to put images front-and-center in your business. This would be a wonderful theme for a photography business, an architect, or any creative professional. WPzoom, the company behind this template, released a recent update that also allows you to use videos as backgrounds on your homepage. Accio from ThemeMakers offers a 2-in-1 solution: a one-page and a regular full-screen WordPress theme that includes 2 responsive sliders, 10 custom widgets, 3 types of portfolios, and 4 premium plugins, including the Layer Slider plugin, TM Visual Shortcodes plugin, TM Layout Constructor plugin, and TM DB Migrate. The page builder plugin, known as the Advanced Layout Constructor, allows you to build complex column- and row-based layouts that are fully responsive and look good on all devices. 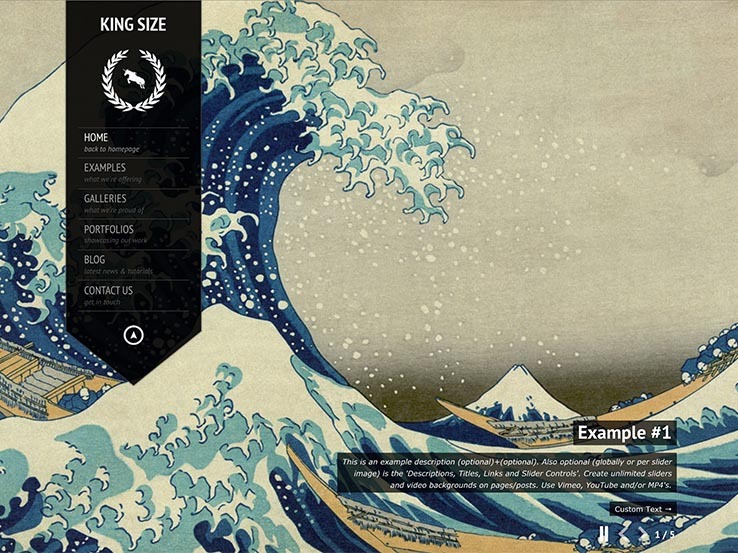 This theme also has many parallax effects and scroll-time animations. If you’re in the market for a theme with the most visual impact, then this may be the perfect fit for your business. 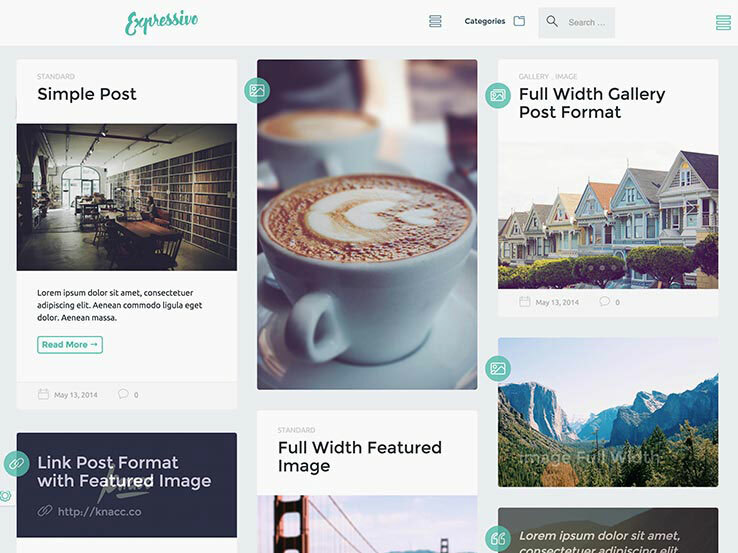 Ellipsis is a beautiful theme for WordPress that offers four unique front page layout options. The parallax image effects really make this theme stand out. Ellipsis comes with a custom theme options panel that allows you to modify the look and feel of the theme to match your brand. Look for advanced options including typography, color, and layout settings. This theme offers some very cool features, like a fit-to-screen slideshow, video and image backgrounds, and a few really neat cursor-activated motion effects. Ellipsis theme is an incredible choice for anyone looking to create a stunning visual presence with their website. Eden is a wonderful theme for businesses and agencies alike. It includes the Qode slider and search field, AJAX animations, fully customizable headers, icons, along with a responsive and Retina-ready design. This theme has huge potential as a business theme, thanks to the modern design and clean lines that put the focus on your most important content. Other notable features include sticky header, bonus parallax pages, Visual Composer plugin, counters, pie charts, horizontal progress bars, icon progress bars, and a whole slew of customization options. Eden is definitely a powerhouse theme worth checking out. 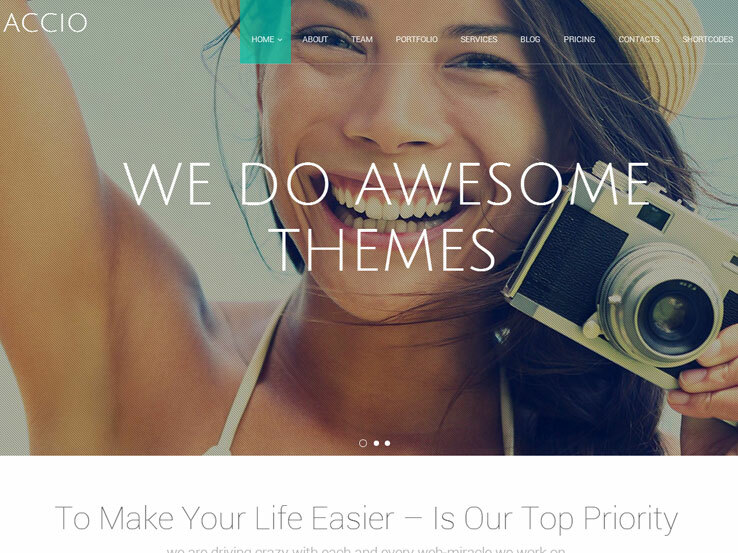 Gleam from Elegant Themes is a fantastic all-around WordPress theme that shouldn’t be ignored. It includes a blog, gallery, portfolio, and various page layouts. It provides an interesting user interaction via AJAX page loads and fit-to-screen background images. The demo on the Elegant Themes website is fashion-oriented, but the theme can easily adapt to other niches and serve as an elegant portfolio or a business website. If you have a local business and want a nice high-impact full-screen style website, Gleam could be a great fit. The Full Screen theme from Themify features a minimal design, responsive layout, and full-screen slideshow. This theme provides a good example of a slideshow that works well at all screen sizes and resolutions and is fully functional for swipe interactions like you would experience on a phone or tablet. Although the design of the inner pages feels a little dated when compared to the rest of the themes on this list, Full Screen still has plenty of features that make it worthwhile, such as 7 predefined skins, social media icons, custom welcome message, and more. 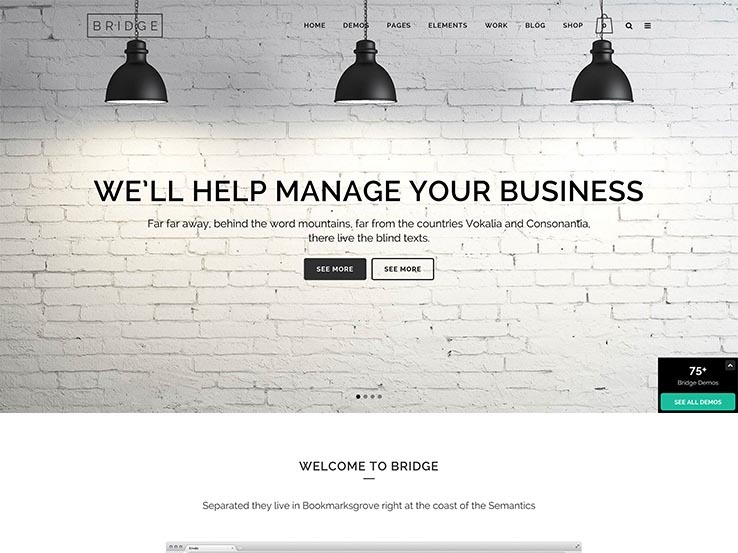 The Bridge theme certainly stands out as one of the coolest full-screen themes on the list–its slider supports high-resolution photos, and you can incorporate buttons and call-to-actions as an overlay with a few simple clicks. Other notable features that make this theme an interesting choice include animated transitions that are always fun to play around with and grab the attention of your users. You can also upload a video background to showcase your products or just use it to welcome your website visitors. The custom mega menu fits hundreds of elements into it, allowing for dozens of product categories and items for people to search through. The theme provides lots of shortcodes that make it easy to customize your website without doing any coding work. 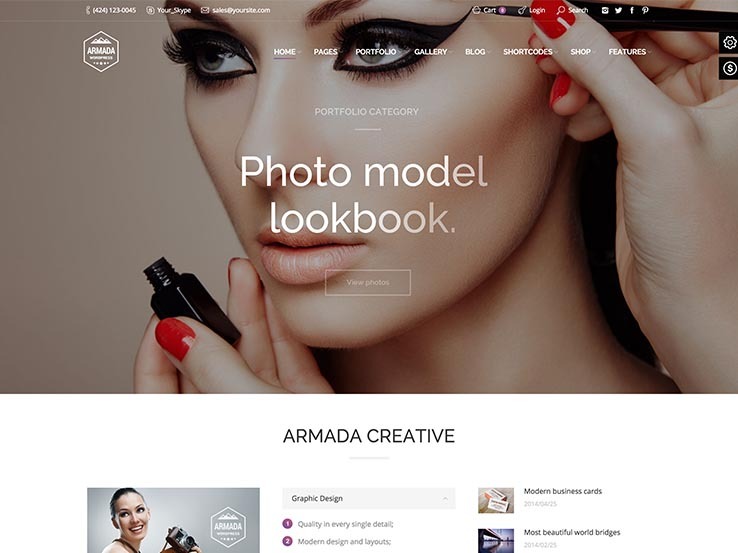 The Armada theme has a full-width slider that offers an innovative way to showcase your photos, and it has some fun animation effects packed into the theme as well! Made primarily for photographers, the theme is also an excellent choice for anyone who wants to showcase their portfolio in a stylish way. The theme has unlimited designs and layouts, and you get 16 ready-made skins, which make it easy to match your website with the rest of your brand. The fancy page titles can be modified on all of your posts, and you can always choose between various showcase options to display your favorite projects. Use the Visual Composer to easily create custom layouts for all the pages on your website and add different responsive layout elements to keep your site fresh and relevant. 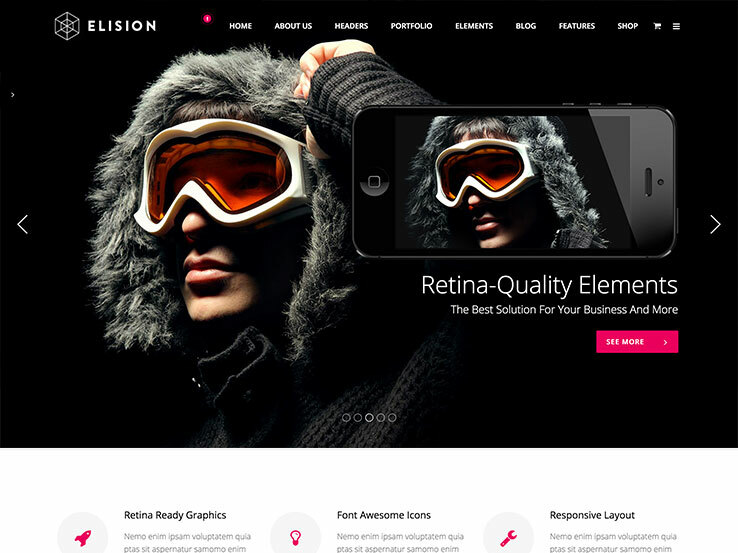 The Elision theme includes the full-screen Qode slider that provides a flexible and sleek user interface. The page builder is intuitive and easy to use for beginners and advanced webmasters alike, and the animated transitions come in handy to add extra visual appeal to your website. Upload a video background for your product showcases, and utilize the custom mega menu to include your most important content without overwhelming your visitors. The theme is compatible with WooCommerce, and you can choose from various shortcodes to easily add more complex design elements to your website. The responsive design has multi-language support, and you can tweak the layout of any page with the drag-and-drop visual builder. 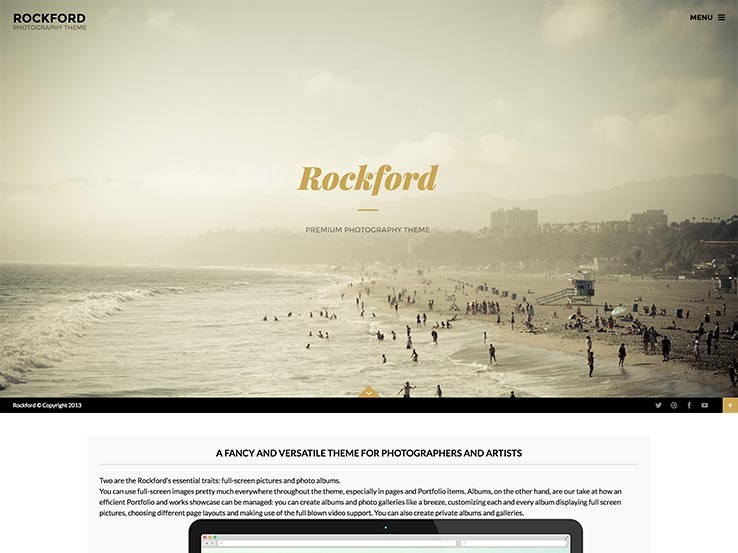 The Rockford theme, geared for photographers, is a favorite on this list because its menu is unobtrusive and the photo support is wonderful. The full-screen, responsive theme incorporates photo albums and a blog area so you can share your photography tips and tricks with your audience. Display your portfolio and make it possible to filter through so your clients can quickly find the work they are most interested in. The theme is translation-ready and allows you to translate your entire website to connect with a global audience, while the powerful theme options are ideal for tweaking the front-end components like logos, images, and posts. 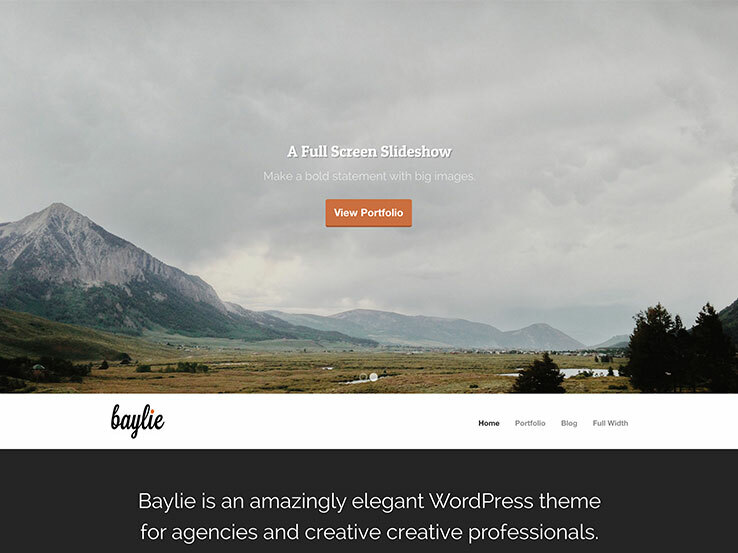 Baylie is a beautiful full-screen WordPress theme, with a responsive layout and slideshow shortcodes for displaying your most important photographs in a wide screen format. The theme options are all consolidated into one area which makes it possible to customize your website regardless of your design experience. The initial slider covers the entire screen, and you can input buttons and text to point the visitors towards your most important pages. Create a filterable portfolio, include a testimonials page or generate cool buttons with the help of shortcodes. It’s a one-page template but thanks to the navigation menu it’s easy to navigate around your website. With logo upload, custom widgets, and localization support, you really can’t go wrong with the Baylie WordPress theme. The King Size WordPress theme is a fun and creative full-screen theme designed specifically for photographers and creative businesses. It includes five different gallery types and the large homepage slider that takes up the entire screen. The navigation menu is placed on the left-hand side so your stunning photography can take the center stage. The background slider allows you to easily incorporate a custom message and a call-to-action button to send people to other important pages. You can also include custom videos in the slider. The King Size theme is fully responsive which means it will look incredible, no matter which device your visitors are using. The new portfolio page has five layouts, and the custom admin panel is easy to use for both beginners and advanced users alike. The shortcodes allow you to add design elements such as buttons and columns. Custom widgets can be added to footers and sidebars. This theme is translation-ready, so you can quickly translate your entire website to any language you desire. Expressivo is sold as a lifestyle blog theme, but it has so many visual elements that you can’t go wrong if you use it for your photography business. Expressivo has a full-screen, responsive layout that looks awesome on all screen sizes, and the masonry-style layout is one of the most unique gallery modules you’ll see on this list. Various post formats include options for images, videos, quotes, and more, and the customization tools offer three layout versions for the header area. You have the option to move the sidebar to the left or right of the content area, and each element that comes with the Expressivo theme has either a dark or black version available. Seven pre-selected color skins are ideal to create the “look and feel” that best suits your brand. Further, the infinite scroll feature helps you pack in as much content as you want without overwhelming your visitors. 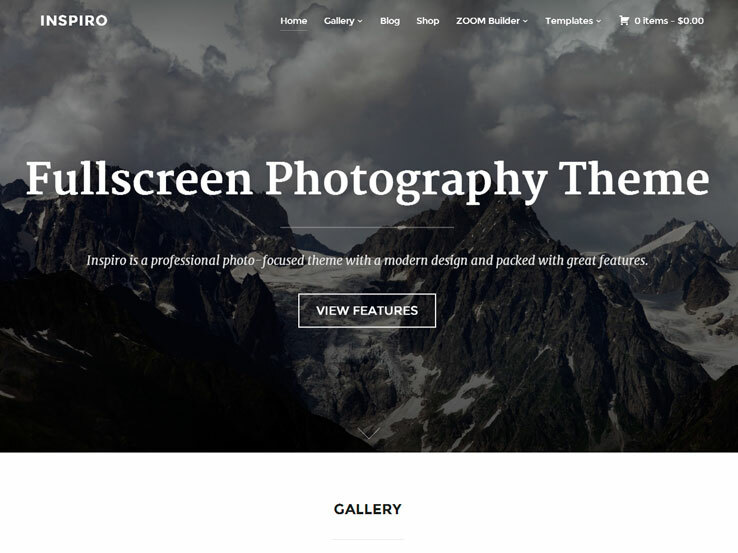 Along with an included contact page, a featured slider, custom page backgrounds, and more, the Expressivo theme is a fantastic choice for any business focusing on photos. 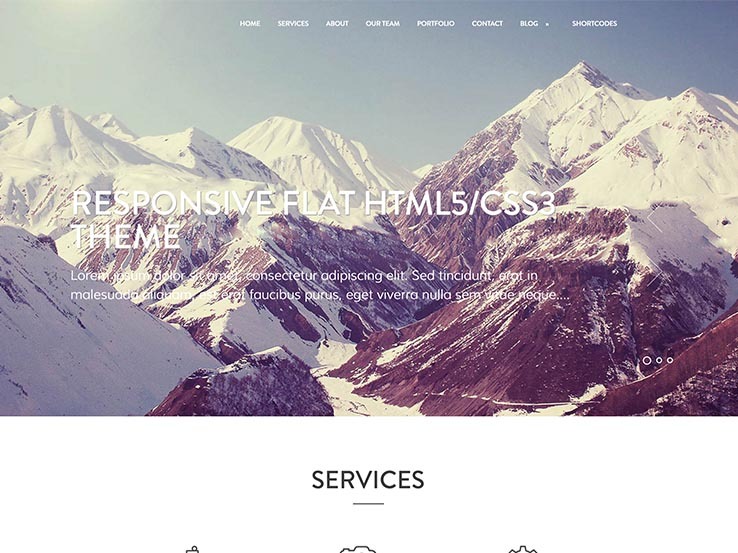 The Mountain theme features a stunning full-screen header area with parallax effects to instantly grab the attention of anyone who lands on your website. This is a one-page theme, meaning all the information about your business will be present on the homepage. Mountain comes with a page builder that facilitates tweaking the layout of your website. The advanced admin panel offers settings for colors, logos, and three header designs. Choose from two blog layouts: Masonry and Classic, each of which is ideal for showing your latest blog posts so you can share tips and tricks with your target audience and increase the traffic to your website. Various Google Fonts are included with the purchase so you can easily customize the typography. The theme also includes FontAwesome icons, which are ideal for adding visual elements to your website. The logo and background image uploader allows you to completely customize your site, while the responsive layout enables people to view the site on mobile devices such as tablets and phones. Add different content types with four post types, including image, video, gallery, and quote. An AJAX contact form keeps you in touch with your customers, and the flat design makes sure your website is in tune with the latest web design trends. Along with a portfolio area and overlaying text for the header, the Mountain theme packs a solid punch in terms of full-screen options. The Black Label has a full-screen header that allows you to implement more than just images. The video support makes this theme stand out from the rest of the competition, since you can welcome your visitors with an intro video to allow them to get to know you or what your company has to offer. 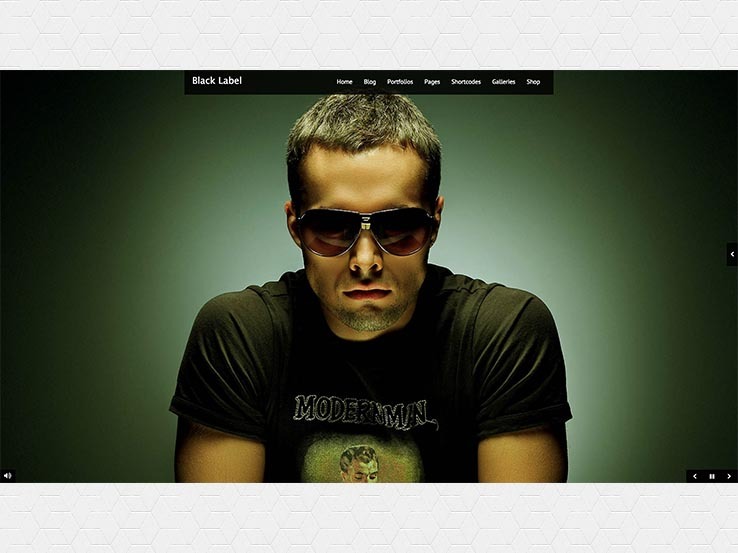 Generate an unlimited amount of portfolios with the Black Label theme and make all the galleries you desire. The responsive design allows people to view your website without any issues, even on smaller screens. Black Label has WooCommerce support, so you can easily transform your website into an online store. It includes translation tools to expand your audience and translate your website into any language you desire. The shortcodes help you design anything from toggles to buttons without the need to dig into the code. The theme includes a blog area, which is a great way to attract visitors to your website. The theme includes two different skins, black and white, as well as social buttons that allow you to grow your following on your preferred social media network. The Core Minimalist Photography Theme is all about setting up a beautiful portfolio with media items. The full-screen theme delivers a responsive design and six gallery options to showcase your best work. Overall, the design is fairly simple, but the video portfolio support is one of those settings that you’ll want to jump on if you plan on having lots of videos on your site. The theme includes light and dark skins which are a nice starting point when you start to set up your website. The gallery makes it easier for users to browse through your imagery, while the full-screen slideshow is the signature feature of this theme. The theme offers plenty of ways to share your work on social media and spread the word about your services. In case you’d like to make certain images private, you can easily password-protect the full-screen gallery. That way, only the people you share the password with will be able to see the content. This might be useful if you plan on having imagery that is meant to be seen only by certain clients or your employees. Along with over 300 Google Web Fonts, the Core theme is one of the best of the bunch. Great list of great looking, contemporary themes! I’ve used the Brooklyn theme and it’s got an awesome back end. Hi Nikki, thanks for the input. We hear lots of great things about Brooklyn and we’re glad to hear more.